Nothing could be more basic than a Provencal macaroon. Yet it is one of the hardest biscuits to make, for it is crisp on the outside and airy and tender on the inside. 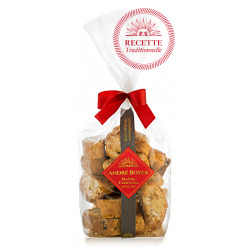 The secret resides in the lengthy work performed on the Provencal almond flour, followed by meticulous cooking. This virtually unknown recipe uses an ancestral cereal known as einkorn, grown on the Sault plateau. 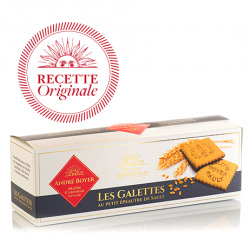 In recent years, it has become renowned for its dietary benefits (it has low gluten content).This ultra-thin galette made with fresh butter is stamped with the historical Boyer seal, which enhances its character. 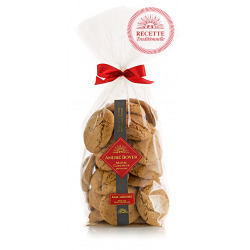 The latest in our line of almond biscuits, made in the purest “Boyer style”. 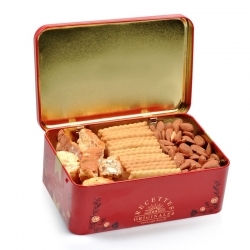 Collector André Boyer's metal box, filled with an assortment of biscuits: 130g of small spelt cakes from the Plateau de Sault, 150g of crunchy almonds, 150g of roasted almonds from Provence.